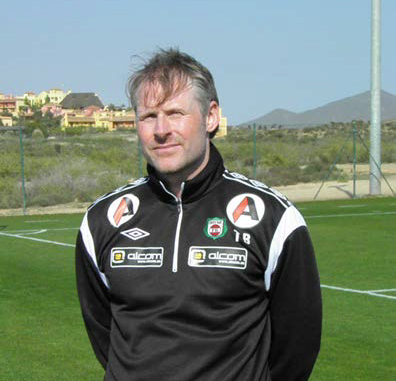 Tommy Bergersen, el entrenador del Bryne FK, 5 entrenadores y su plantilla de 23 jugadores – que compiten en la Primera División de Fútbol Noruego, han regresado a la Academia de Fútbol localizada en Desert Springs Resort (Almería) por cuarto año consecutivo, para completar un stage de 4 días de entrenamiento entre el Martes 6 – Sábado 10 de Marzo. Durante su estancia en Desert Springs Resort los jugadores de Bryne FK han disfrutado de su entrenamiento en el campo de fútbol de hierba natural con dimensiones internacionales de la Academia de Fútbol. “Como siempre, el alojamiento en el Resort es excelente y muy confortable, la calidad de la comida es estupenda y quiero agradecer el “Menú de Cena Especial” en la última noche y también el detalle que han tenido con los dos cumpleaños celebrados durante nuestra estancia! La calidad del campo de fútbol es magnífica, tal y como esperábamos, y la nueva portería nos ha venido muy bien. El nuevo diseño de las instalaciones del gimnasio en el Sierra Sports Club ha sido una gran mejora y tiene más espacio para que los jugadores estiren y hagan ejercicios en el suelo. Los jugadores de Bryne FK y sus entrenadores se han alojado en alguno de los Apartamentos de propiedad privada utilizados para vacaciones y escapadas en Desert Springs, y el Chef del Resort ha trabajado para cumplir las necesidades dietéticas de cada jugador durante sus comidas en los dos restaurantes del Resort - el Galardonado El Torrente y el Restaurante Cocodrilo, parte del Club Cocodrilo. Subject: Reporting on the visit of Bryne Fotballklubb for their official Warm Weather Winter Training Camp. Bryne Football Club Team Manager Tommy Bergersen, five coaches and his squad of 23 players– which currently competes in the first division of the Norwegian Football League, returned to the Desert Springs Football Academy established at the Desert Springs Resort in Almeria, south east Spain for their fourth consecutive year, to complete their 4 daywarm weather winter training programme between Tuesday 06th - Saturday 10th March. I met with Bryne Football Club Manager, Tommy Bergersen, for an informal meeting to receive his views and opinion on how he felt the visit to Desert Springs Resort had gone. “As always, the resort accommodation was excellent and very comfortable, the quality of the food was perfect and special thanks for the “Special Dinner Menu” on our final evening and also the special attention given for the two birthdays that were celebrated during our stay! The quality of the football pitch was as we have come to expect, excellent, and the introduction of the new portable goal was very useful. The new layout of the gym facilities at the Sierra Sports Club is a great improvement as it has allowed us more space for floor exercises for the players. The Resort staff were all very friendly and helpful. Two of us had required medication whilst we have been here and a member of staff has been to the chemist, picked it up and delivered it to us. This is the kind of service that makes Desert Springs so special, and that’s why we come back every year. special dietary requirements of individual players dining in the resort’s tworestaurants – the award-winning El Torrente and the Croc Restaurant, part of the family-friendly Crocodile Club. I met with the Bryne F.K. manager, Tommy Bergersen, for an informal meeting on how he thought the trip had gone to get as much feedback as possible. Excellent as always, very comfortable. Again excellent, the menus were perfect and thank you for your flexibility with the meal times. Last year the quality of the pitch was excellent, this year it is even better. You simply do not find such high quality pitches to train on anywhere else. More than adequate for what we require. A few of us have used the Driving Range and found it very good. Yes, we definitely would like to return next year; we will contact you after the 2011 season. the staff, the food, the accommodation and also the personal attention we receive. Please send me an introduction letter, so that we can pass it to other teams in Norway with my recommendation. On Friday 12th March I met with the Bryne F.K. manager, Tommy Bergersen, for an informal meeting on how he thought the trip had gone to get as much feedback as possible. (J) Tommy your first visit to Desert Springs (Bryne’s second) – did you enjoy your stay? (T) Yes we did everything about our stay was perfect. (J) Was you accommodation up to standard? (T) Yes the apartments were first class and nicely furnished making our stay here very comfortable. (J) How was your dining experience in both restaurants? (T) All the meals from breakfast to dinner were excellent and all our dietary requests were met. (J) Were the staff friendly and helpful? (T) The staff were all very helpful and nothing was too much trouble for them, including you of course Jim. (J) Did the football pitch meet your expectations? (T) The pitch was fantastic I have to say and the whole squad agrees it is the best surface they have ever played on. In Norway 70% of football pitches are Astroturf so it was a treat to have a perfect playing surface on grass. (J) How did you find the rest of the Sierra Club sports facilities? (T) Excellent a few of the players used the gym which is very well equipped. (J) Did you use any of the other facilities during your stay? (T) Not on this trip because we did not have enough time. However next year we would like to come back for a week to take full advantage of the resort and even play a round of golf on your wonderful looking course. (J) Is there anything we could have done to improve your stay at Desert Springs? (T) No the whole trip was perfect and being the first time here I was interested to see how good it was because the players that were here last year had such a good time. They did not want to go anywhere else and now I know why and agree. (J) So therefore can we expect that you will be returning to Desert Springs? (T) Yes as I said earlier we would like to come back and for a week next year finances permitting. (J) Can you think of anyone you could recommend Desert Springs to? (T) Yes and I think it would be beneficial to get in touch with all the league clubs in Norway to invite them out to see your facilities here. You can use me for any personal recommendations. 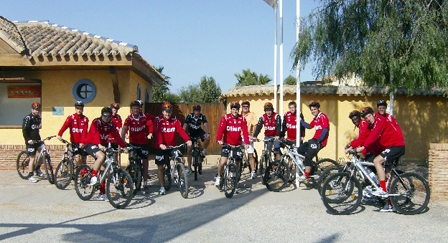 (J) Could you please sum up a description of your training camp stay at Desert Springs for our website? thing you will need to have to be careful of is maintaining the standard when you have more teams coming here for training which I’m sure you will have. Eventually you will need more pitches to accommodate the additional teams training here too. 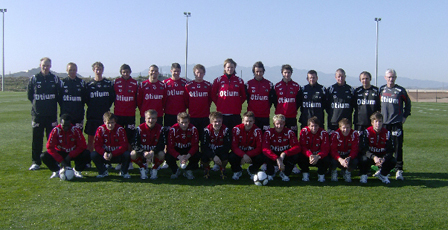 A squad of 22 players and three coaches from Honefoss Football Club – which currently competes in the Tippeligaen, the top tier of Norwegian football, after promotion at the end of the 2009 season – are following in the footsteps of the country’s pioneering second division Bryne Football Club which last year was the first to benefit from the facilities of the Football Winter Training Camp established at Desert Springs in the Almeria area of Spain.During a four-night stay at the Desert Springs Resort in south-east Spain – Europe’s only international award-winning luxury family resort and championship desert golf course – the Honefoss players will benefit from training and coaching on the first international-size quality grass pitch in Almeria. Since it was inaugurated by Sir Bobby Charlton and Sir Geoff Hurst in 2004, floodlights, shower and changing facilities and a referee changing room have been added. More recently, in response to requests from visiting teams, a new hard standing area provides outside space for facilities such as a free weights gym, stretching mats and a medical area. And for the first time this year players will be able to make use of a newly-sewn dwarf rye grass area planned specifically for goal-keeper training and five-a-side games. During Football Winter Training Camps, players can make full use of the 18-hole Indiana golf course and enjoy opportunities to swim, play tennis and use the gymnasium, trim trail, jogging tracks, paddle tennis and beach volley ball courts. They also have access to the resort’s Private Reserve which incorporates a spa, private sauna and jacuzzi suite, personal fitness workout room, games room with bar, and a home cinema. Simon said that when Honefoss visits next month, the resort’s executive chef will be on hand to cater for the special dietary requirements of individual players dining in the resort’s two restaurants – the award-winning El Torrente and the Croc Restaurant, part of the family-friendly Crocodile Club. Already well-known as a resort specialising in family holidays, Desert Springs is gaining popularity as a centre for warm-weather training for golfers and cricketers, as well as footballers. The warm weather football training facilities at Desert Springs in Spain are the talk of the footballing fraternity in Norway, it seems. The news follows a visit by Norway’s second division Bryne Fotballklubb to Europe’s only international award-winning luxury family resort and championship desert golf course for four days of training and coaching on the first international-size quality grass pitch in the Almeria area of south-east Spain. The club’s coach, Rolf Teigen, was so enthusiastic about the calibre of the resort, its football pitch, other sports facilities, restaurants and accommodation, that he has pledged to spread the word to other Norwegian clubs. Since the Desert Springs football pitch was inaugurated by Sir Bobby Charlton and Sir Geoff Hurst in 2004, floodlights, shower and changing facilities and a referee changing room have been built. In response to requests from visiting teams, a new hard standing area provides outside space for facilities such as a free weights gym, stretching mats and a medical area. Recently additional space for goal keeper training and five-a-side games has been added. Clubs opting for warm weather training packages can make full use of the 18-hole Indiana golf course and enjoy opportunities to swim, play tennis and use the gymnasium, trim trail, jogging tracks, paddle tennis and beach volley ball courts. Accommodation for players is in the privately-owned apartments, cottages and villas which are available for holidays and short breaks at Desert Springs. If needed, the resort’s executive chef can be on hand to cater for the special dietary requirements of individual players dining in the resort’s two restaurants – the award-winning El Torrente and the Croc Restaurant, part of the family-friendly Crocodile Club. Already well-known as a resort specialising in family holidays, Desert Springs is gaining popularity as a centre for warm-weather training for golfers and footballers, as well as cricketers. 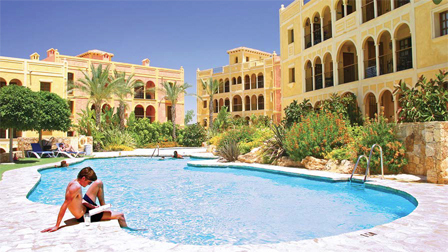 For details call the Cheltenham-based Almanzora Group +44 (0) 1242 680116.